Renée is the Assistant Conservator for Library and Archival Materials at the American Philosophical Society. What do you like about being involved with the Society of Winterthur Fellows? I am pleased to be part of an organization that has done so much to help further my education and my professional standing. I know I have benefited from the generosity of alumni who came before me, and I am glad to be able to give back to those who will follow me. And it is a treat to stay connected to Winterthur and all the dedicated people who work there. Give me a funny anecdote or memorable moment from your days as a Fellow. As Renée Catherine Wolcott, I share my initials with paintings conservator and WUDPAC professor Richard Craig Wolbers. I usually write "RCW" on my tools as my stamp of ownership. When I was a graduate student in the WUDPAC program, Richard took my tiny plastic tray for casting paint samples in epoxy, since it had his initials on it. I only got half of it back. What class prepared you best for your career and why? Ironically, the class that best prepared me for both my careers was "Frosty" Murdock's high-school class in anatomy and physiology. He insisted that his senior-level students take copious notes, doing their best to transcribe his lectures. He pitted the two sections of the class against each other to see who could take notes the best. That ability to write fast, and to filter through the mass of words for the high points of each lecture, made me a much more engaged and analytical student. 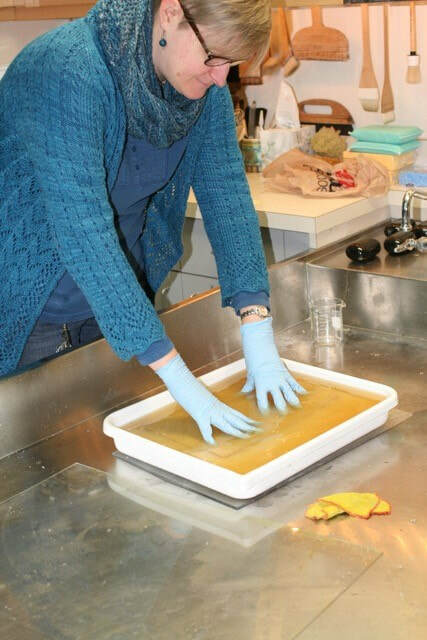 Renee bathes manuscript leaves in a calcium phytate solution.